Bead Maze Traditional is a lovely classic Bead Maze with a nice solid base. 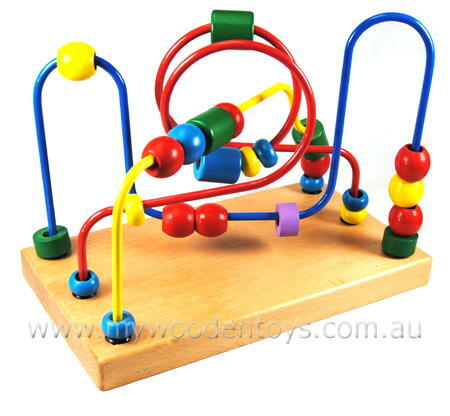 As your little one twists and turns the beads around the roller coaster of nice thick coloured wire they can learn about the colours and shapes. A nice solid toy this bead maze will be a firm favorite. A great size with lots of ups and downs and round and rounds it will keep little fingers busy negotiating the corners. A wonderful toy to help develop spacial awareness and motor skills. Material: Wood with Child safe paint. We like this because: "Great traditional toy, well made, perfect size." So impressed with the efficient service and when the music set arrived we were very happy. Can't wait to give it to our gorgeous grandson for Christmas!